Your research lab is experimenting with microarrays and you've invested in hardware, chips and software for image analysis. Along with the hardware you may have received some basic data analysis software. Are you getting all that you can from your data based on this large investment? Does the software you have make it easy to do a proper, statistically significant analysis without spending a fortune on yearly subscriptions? Improved Outcomes' GeneLinker� Gold is ideally suited for exploratory analysis and offers the best analysis features from multiple different microarray analysis products integrated seamlessly into one application. Within ten minutes of installing the software, novice users are able to start exploring their data and learning things that would be impossible with tools like Excel, or would take significant training and time with competing products. 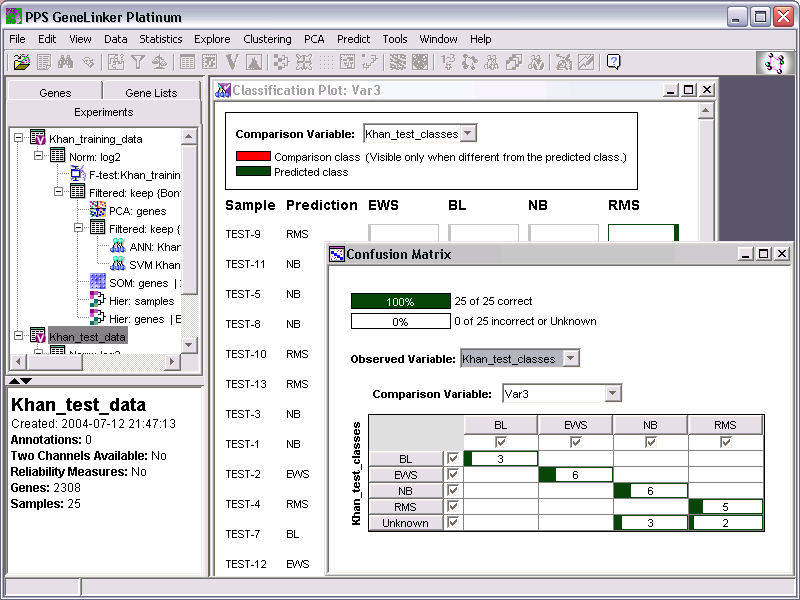 GeneLinker� Platinum is targeted at more in-depth analysis and contains advanced classification and prediction features. Platinum offers all of the features of Gold plus powerful feature detection algorithms (e.g. the patented SLAM algorithm for discovering association rules), committees of artificial neural networks (ANNs), committees of support vector machines (SVMs) and committees of Bayesian classifiers (the Integrated Bayesian Inference System - IBIS). Platinum also includes external Perl scripting (XScripts) to allow advanced users to incorporate their own proprietary analysis algorithms (e.g. proprietary normalization methods). Have a look at the product feature list for a complete description of both products. A side by side comparison of desktop microarray software analysis products is also available. All of the GeneLinker products provide an easy to use data import process that supports delimited text files, 2 colour data and a variety of native chip formats. Currently there are over 20 supported formats including: Affymetrix 4.0 and 5.0, CodeLink, GenePix, Genomic Solutions, Quantarray and ScanArray. New formats can be supported easily and Improved Outcomes is always looking to add support for new file formats, usually within a few days of receiving a sample file. GeneLinker offers a variety of normalization options including log scaling, scaling to a baseline sample, linear ratio-based methods, normalization using control genes and lowess. GeneLinker provides a summary statistics feature that can be helpful in deciding which normalizations or analysis methods to apply. A variety of ways of prioritizing genes are provided including statistical prioritization (F-test and Kruskal-Wallis tests with BonferroniFalse Discovery Rate calculations), profile matching and N-fold induction and regression. GeneLinker offers reliability based value removal and missing value estimation. All of these features make it easy for you to focus on the genes that you are interested in (using gene lists) and to eliminate poor quality data from further analysis. From a statistics perspective, GeneLinker also supports creating randomized variables. One-click experiment or workflow scripting makes it easier to validate your analyses using permutation tests. 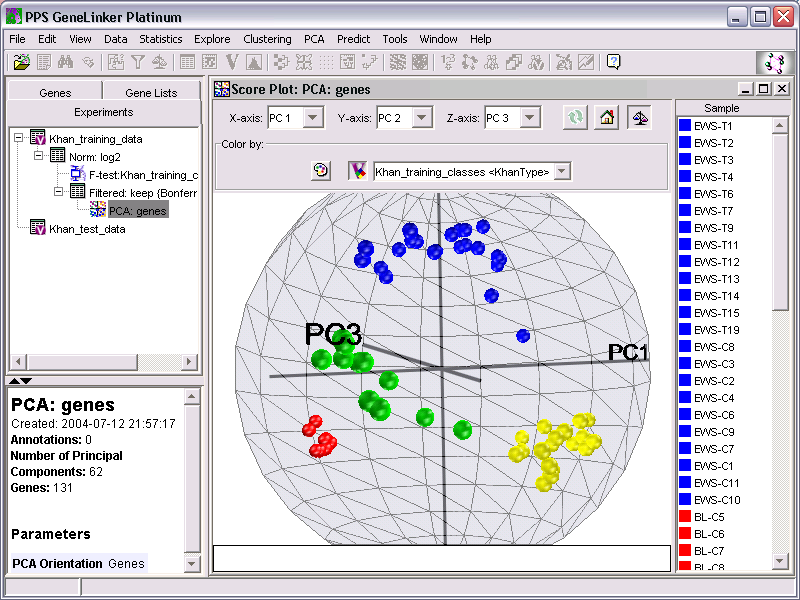 GeneLinker provides all of the traditional exploratory analysis methods that scientists have come to expect, all in one application; including Principal Components Analysis (PCA) and a variety of clustering methods that can be applied to genes or samples (or both). The clustering algorithms include: Self-Organizing Maps (SOMs), K-Means, mutual nearest neighbour (Jarvis-Patrick) clustering and Hierarchical clustering using single, average or complete linkage. A variety of distance metrics are also supported including Euclidean, Manhattan, Pearson Correlation and Spearman Rank Correlation. 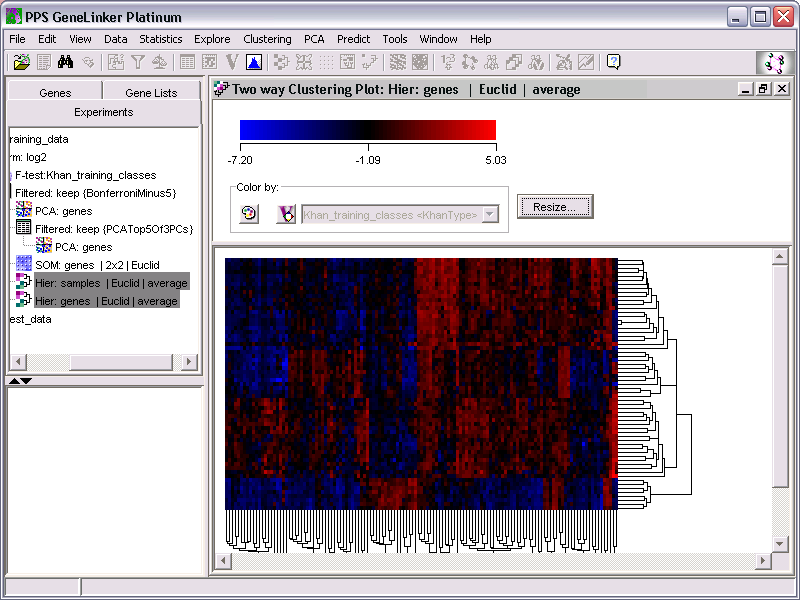 GeneLinker supports all of the visualizations that you require for Gene Expression and Proteomics Analysis including: Scatter Plots, Coordinate Plots, a variety of 2D and 3D Score Plots, Histograms, Matrix Plots (Colour Array Plots), Matrix Tree Plots (1 and 2 way Dendrograms), SOM Plots, Cluster Plots, Profile Plots and many others. GeneLinker allows you to display multiple different visualizations of your data at the same time. 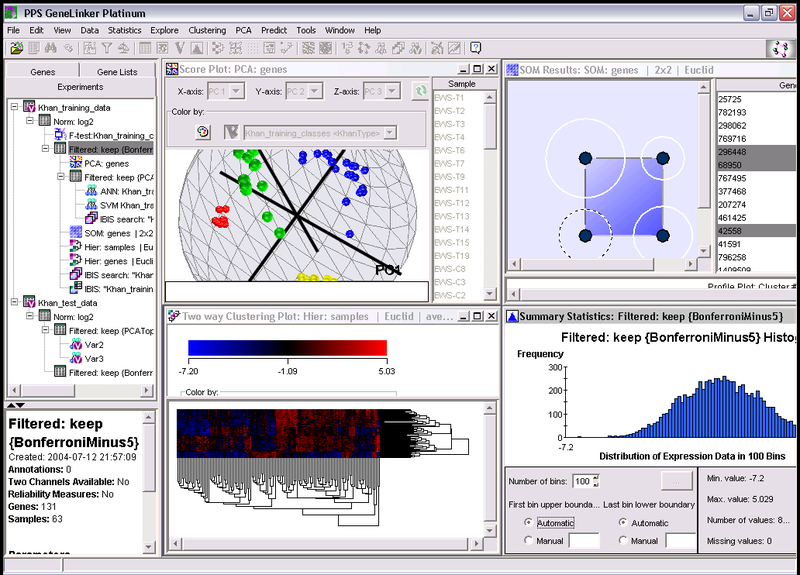 The visualizations are also linked so that clusters, genes or samples that are selected in one visualization are also selected in other open visualizations. The visualizations also support colouring by clinical variables or gene lists. To help add meaning to your numerical analysis, you can look up genes in external web databases such as GenBank, Unigene and NetAffx. When you are ready to publish your results, GeneLinker makes it easy. You can export graphics for the web in PNG format or export publication-quality graphics using either SVG or PDF formats. The experiment navigator provides a detailed audit trail should you wish to repeat an analysis or an entire workflow and you can generate single experiment or entire workflow reports (including graphics) at the click of a button. GeneLinker also makes it easy to export your data to other applications such as Ariadne Genomics' PathwayAssist application with a single mouse click. This allows users to analyze their data using GeneLinker and then see how the results fit into existing pathways or create new pathway models. This also extends integration with the existing literature, allowing browsing of the ResNet pathway database or validating facts by going back to the original literature. 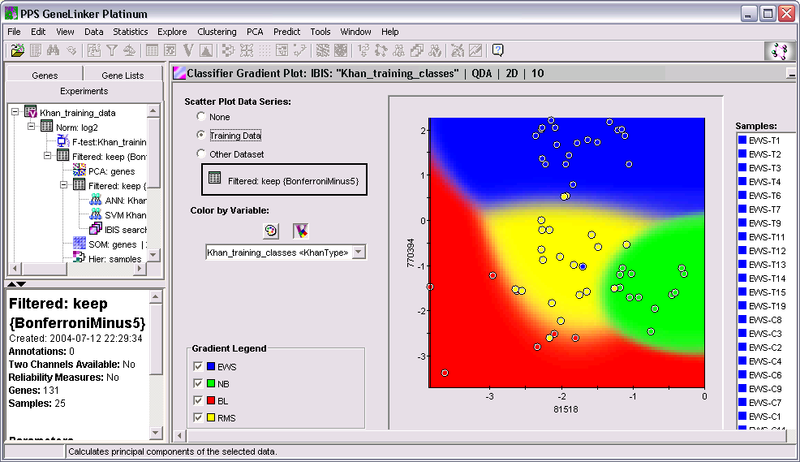 GeneLinker scales well, allowing analysis of very large datasets. All of GeneLinker's analysis methods have been optimized for speed and memory use on large data sets. They are all implemented in C++ giving them a tremendous advantage over products implemented entirely in Java. This means that a low end desktop machine is sufficient to analyze even large data sets. These scalability characteristics are assisted by GeneLinker's scalable relational database that stores all of your data sets and analyses in a single repository. The default database is MySQL, which provides excellent performance and robustness. Unlike some of our competitors, there is no limit to the number of datasets you can operate on or on the size of the repository. GeneLinker also supports IBM's DB2 and Oracle 9i Databases with easy to use configuration applications. Multiple repositories can be configured to make it easier to manage multiple large analysis projects. The committee architecture results in trained classifiers that are less susceptible to over-training or a poor partitioning of the data. GeneLinker has also been used successfully to analyze multiple proteomics data sets (mass spectrometry data) using either channel or peak data. A tutorial is included on the Improved Outcomes website and several other white papers are available on request. GeneLinker includes an extensive online help system that provides detailed instructions as well as advice for how to analyze data. The entire user manual is also available on the website for easy searching and as a pdf for easy printing. Buy any of the GeneLinker products and use them forever. Unlike many of our competitors there are no annual license fees. After you purchase the software you are entitled to one year of free upgrades (minor and major versions) and support. After the first year, you can choose to purchase annual maintenance contracts, entitling you to further upgrades and support or you can continue to use the versions that you've purchased in perpetuity. Annual maintenance contracts are significantly discounted from the new purchase price. GeneLinker� Gold is priced at less than half of the price of all of our major competitor's equivalent products ($995 US) and discounts for site licenses are available, even for relatively small numbers of users. Many of the features in GeneLinker� Platinum ($4 995 US) aren't available in any of our competitor's products at any price.